al-Hawl (Arabic: الهول‎, translit. al-Hawl, lit. 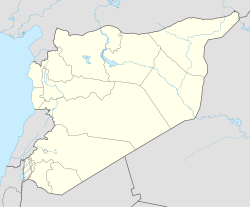 '"swampland"'), also spelled al-Hole, al-Hol, al-Hool and al-Houl, is a town in eastern al-Hasakah Governorate, northeastern Syria. It is administrative center of the al-Hawl Nahiya consisting of 22 municipalities. At the 2004 census, the town had a population of 3,409. During the Syrian Civil War, al-Hawl was seized by Islamic State forces and had become one of the major ISIL strongholds in northeastern Syria. On 13 November 2015, Al-Hawl was captured by the Syrian Democratic Forces (SDF), in what was considered as the first strategic success by the then newly established SDF. North of the town is a significant road junction connecting the provincial capital with the Iraqi border. While the northeastern branch proceeds towards Tall Hamis and the Rabia border crossing, the southeastern branch towards the Sinjar mountains passes through the town southeastwards, reaching the Makhfar Umm Jaris border crossing after some 20 kilometres (12 mi). The town is surrounded by disused military bases formerly used by the Syrian Army and abandoned in February 2013. In early 1991, during the Gulf War, the United Nations High Commissioner for Refugees established a refugee camp in the southern outskirts of al-Hawl, which was operated in cooperation with the Syrian government. Along with another camp in al-Hasakah, it provided shelter to at least 15,000 refugees from Iraq. Following the 2003 invasion of Iraq and the subsequent Iraq War, the camp was later reopened as one of three camps at the Iraqi–Syrian border, when an exodus of Palestinian refugees living in Iraq occurred due to persecution by the newly-installed Iraqi government. In the context of the Syrian Civil War and the takeover of Al-Hawl by the Syrian Democratic Forces (SDF), the al-Hawl camp has come to be inhabited by more than 74,000 refugees as of April 2019. More than 40,000 of these people arrived after December 2018 in a series of massive civilian evacuations from the town of Baghuz Fawqani, fleeing the fierce two-month battle for the town between the SDF and ISIL. Conditions along the road to the camp, including in screening centers for ISIL operatives, have been described as "extremely harsh" with limited food, water, shelter and no health services. Aid organizations feared dysentery and other diseases could break out from the overflow camp. The UN stated that 84 people, mostly children, died on the way to Al-Hawl from December 2018 to March 2019, mostly due to hypothermia. Around 500 families in the camp are family members of ISIL fighters, including a large number of foreign nationals. They are however kept in a separate guarded section of the camp after repeated violent incidents between them and other members of the camp. In the course of the Eastern al-Hasakah offensive of Syrian Kurdish YPG, Islamic State of Iraq and the Levant militants were expelled from large swaths of eastern Hasakah, including Tell Hamis and Tell Brak. The southeastern Hasakah countryside around al-Hawl however remained one of the last ISIL strongholds in the province. In late October 2015, following the successful Battle of Hasakah, the SDF launched their al-Hawl offensive slowly advancing southwards from Tell Hamis. On 11 November they seized Khatuniyah and moved on around the lake further southwards to surround al-Hawl from both northeast and south on 12 November. On 13 November, al-Hawl was captured, in what was considered the SDF's first strategic success. In the following days, the SDF advanced further westwards to close the remaining ISIL-held pocket around the villages of Abu Hajirat Khuatana and Khuwaytilah. The town is located some 40 kilometres (25 mi) east of al-Hasakah, on the southern bank of the dried-out wadi ‘Aţā Allāh. While the wadi has dried out, the spring ‘Ayn al-Hawl, located south of the town, still carries water. Nearby villages include Sheikh Ma'ad with the Sheikh Ma‘ad shrine to the north, just across the wadi. ^ a b "2004 Census Data for Nahiya al-Hawl" (in Arabic). Syrian Central Bureau of Statistics. Retrieved 15 October 2015. Also available in English: UN OCHA. "2004 Census Data". Humanitarian Data Exchange. Retrieved 4 December 2015. ^ Master. "The Syrian Democratic Forces seize the town of al- Hol in the eastern countryside of al- Hasakah". Syrian Observatory For Human Rights. Archived from the original on 17 November 2015. Retrieved 14 November 2015. ^ Third World Institute, ed. (2005). The World Guide: A View from the South 2005/06. Oxfam. p. 533. ISBN 978-1-904456-11-7. ^ Mohsen Moh'd Saleh, ed. (2007). The Palestinian Strategic Report 2007. Beirut: Al-Zaytouna Center. p. 357. ISBN 978-9953-500-676. Retrieved 2019-03-13. ^ "Syria's Al Hol Camp: Families in Desperate Need". 22 March 2019. ^ "At least 84 die fleeing Daesh in Deir Ezzor in east Syria: UN". Arab News. Geneva. 2019-03-01. Retrieved 2019-03-13. At least 84 people, two thirds of them children, have died since December on their way to Al-Hol camp in northeastern Syria after fleeing Daesh in the Deir Ezzor region, the United Nations said on Friday. ^ "Flash Update 1: Displacement from Hajin, Deir-ez-Zor Governorate". UN Office for the Coordination of Humanitarian Affairs. 2019-02-04. Retrieved 2019-03-13. The camp currently hosts more than 35,000 people and has largely surpassed its maximum capacity. Since 22 January 2019, some 10,000 people have arrived at the camp, straining response capacities. ^ Romeo Langlois, James Andre (2019-02-08). "FRANCE 24 exclusive: The battle-hardened foreign jihadi brides trapped in Syria". France 24. Retrieved 2019-03-13. Almost all of the women in the Kurdish-controlled al-Hol camp in northeastern Syria are foreign nationals who travelled to Syria at the height of the IS group’s so-called caliphate. They are held in a fenced-off area away from the other camp residents. ^ Roy Gutman (27 October 2015). "New allies in northern Syria don't seem to share U.S. goals". McClatchy DC. Archived from the original on 14 November 2015. Retrieved 7 November 2015. 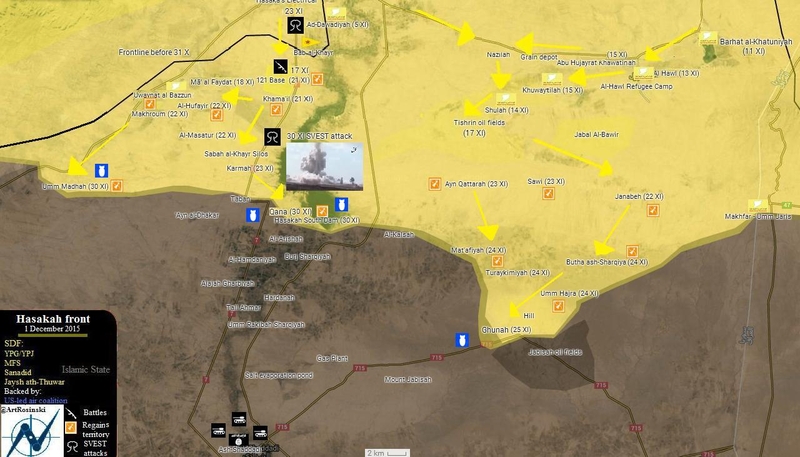 ^ "SDF/YPG Offensive In East Hasakah". Retrieved 14 November 2015. ^ "Hasakah front: 1 December 2015". Archived from the original on 2015-12-08. Retrieved 2015-12-05. Cite error: A list-defined reference named "Dateline2019-02-28" is not used in the content (see the help page). This page was last edited on 16 April 2019, at 18:58 (UTC).